Never should have let my 1988 go....new member. Thread: Never should have let my 1988 go....new member. My parents demanded I sell my 1988 Accord DX and I still regret giving in! I have found myself looking for another one even though I continue to keep my 2002 Accord going. So here I am to chat with you folks and maybe, maybe, buy another 86 to 89! When I first saw the 1988 DX I thought "crap, she's a sedan!" but after driving her and enjoying that 5 speed manual, I was instantly in love! She had seen rough times with previous owner(s) as she had cigarette burn holes in the rear seat, the cruise control, tape deck, and AC worked only when those wanted to, but I loved that car. I took her everywhere and did everything I needed to do in her. I should have gotten those minor things fixed, hired a fabricator to fix that sagging front bumper, and kept her going all this time! I am 43 years old, single (although dating a wonderful GF), and I miss my old car. Re: Never should have let my 1988 go....new member. I turned 40 this year and finally got around to graduating college for a career change. For my midlife crisis i found a 62k mile 86 Prelude to get back what i had with my first car. So if you can find one, grab it. Although at this age I would recommend a fuel injected, but I am biased against carbs. Search Craigslist nationwide. I flew to Connecticut to get mine after 3 months of looking. Last edited by night; 09-02-2018 at 02:35 PM. Flew to CT? I have been thinking about how I'd get to where a car might be: if a few states away, rental car. If too far, fly. Welcome! Best of luck with your search. Can't see my car? Install the "photobucket embed fix" Add-On in your Firefox browser. Check craigslist. I do it all the time just for kicks. But your best bet would be the West Coast. States like Washington, Oregon, Cali. Warm states. There are few hatches listed currently. Carbed or fuel injected shouldn't matter. Good luck! My first Honda. 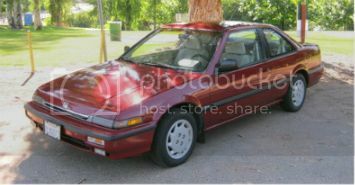 89' Accord DX sedan, Auto. 48,000 current original miles from my friends grandma. Bought locally new in 1989, always garaged. Washed every week. Parked in garage for 3 years, she's 90 stopped driving. Only cruise & tilt wheel. $12,100 new. A joy to drive, rides better that my new Cadillac's. My friends think I'm nuts for loving to drive it all the time! A GREAT engineered car! LOL. Everyone looks at me strange too because I love mine so much. Welcome! I have my 86 LXi for 25 years. As I'm getting older (over the hill) and have started our own business, my wife has been saying this "How much longer you are going to keep this car? We don't have time to maintain it." Yes, I just put it inside the garage for 10 days and changed out the head gasket. I had rustoleum job on it so it looks presentable. Its mostly my weekend car (my wife and I run our business together so we usually drive the Lexus) and the car does show signs of aging. I have hard times thinking I would let it go. Mostly is not knowing if there will be a new owner (wife did threaten about junk yard and I don't think they will even take car this old). Even if there is a new owner, is that guy love the car as much as I do ? Usually I stop thinking as I get to that point. Funny is my 20 years old said to me the other day he wants the Accord if I can pass it on to him. But with his technical knowledge about cars, I'm sure I will be the one continue working on it LOL. Last edited by AC439; 12-04-2018 at 03:54 AM. When I met my wife, I explained that my obsession with this car is because It'll never wake up one day and tell me it doesn't love me. She's hinted once or twice about selling it, and I have to remind her that you can't sell humans on craigslist so shes stuck with me, and the Honda. "What's my age again? What's my age again?"